'On The Table': Options For Ending The Iran Standoff The U.S. is determined to prevent Iran from developing nuclear weapons, saying ominously that "all options are on the table." But just what are those options? Are any of them up to the task of stopping Iran from getting the bomb? Iran's state-run Press TV showed images of Iranian President Mahmoud Ahmadinejad touring Tehran's research reactor on Wednesday. It was one of the more surreal photo ops this week: Iran's president Mahmoud Ahmadinejad, live on Iranian TV, visiting a nuclear reactor. 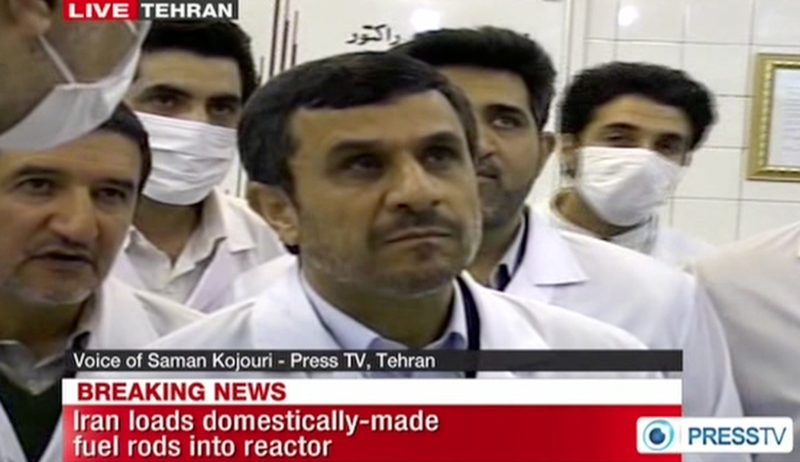 Ahmadinejad trumpeted his country's nuclear progress, but denied, once again, that Iran is pursuing nuclear weapons. In Washington, officials weren't buying it. They rushed to repeat the official U.S. line — a line President Obama himself is fond of delivering. "Let there be no doubt: America is determined to prevent Iran from getting a nuclear weapon, and I will take no options off the table to achieve that goal," he said. But just what are those options? Can any of them stop Iran from getting the bomb? This week, the bombs that made headlines were attacks against Israeli diplomats in New Delhi, India and in the Republic of Georgia. The wife of an Israeli diplomat was injured in New Delhi; the bomb in Georgia was defused. Investigators believe they were probably the work of Iranian agents. In Thailand, Iranians were caught preparing bombs that Thai officials said were also meant for Israeli diplomats. The Iranians may be getting serious in their declared intention to retaliate for the assassination of some of their nuclear scientists. But Scott Stewart, a terrorism analyst with the intelligence firm Stratfor, says he was struck by the amateurish quality of this week's bomb operations. Even rudimentary car bomb attacks, he points out, require some expertise. "Like any sort of terrorist attack like that, you really need to have good planning," he says. "You need to have excellent surveillance; you really have to know the routine of your target, of course, then you need to make a good device — something that's going to function as planned. And then you need to place it in a good spot where it's going to be effective." The car bomb used against the Israeli diplomat's wife in New Delhi proved ineffective. She was injured, but not killed. One of the Iranians in the Thailand operation managed only to blow his own legs off. "In this case, we're not seeing a lot of sophisticated tradecraft," Stewart says, "so it could indeed be a case of them rushing things." If the Iranians are rushing retaliation, it could mean they are in disarray. It's also possible these attacks — should they prove to be directed from Tehran — were done without expert help from Hezbollah. If so, the attacks may reveal as much about Iran's weakness right now as its strength. Of all the options the U.S. says is on the table, Michigan Republican Mike Rogers says he believes sanctions are the best way to go. The impact they've already had on Iran, he says, proves they're working. "What we have done about cutting off their ability to get to the financial market has been devastating to them," says Rogers, who chairs the House Intelligence Committee. "It has gotten their fangs out, clearly." That the response from Tehran has been further defiance is true enough, he says. "But they did slip in that they would go back to the negotiating table." Trouble on the streets of Iran may be pushing them there. People can't get cash from the banks, Rogers says. Inflation is outrageous, food prices have shot up and gas shortages are common. "So the reason the regime is kind of buckling in is because they're under that much pressure." "If we let that wait, and you let them understand that you're serious, you will take out their nuclear enrichment capability if you have to, I think that can be a means to a peaceful end," Rogers says. Iran might be willing to step up to the table, but it's unclear whether it means to offer meaningful and binding nuclear compromises, says Karim Sadjadpour of the Carnegie Endowment for International Peace. "Iran and the U.S. have two different philosophies of negotiation," Sadjadpour says. "In the United States there is the famous book about negotiations called Getting to Yes. The Iranian equivalent of that book would be Staying on Maybe." Iran's strategy may once have been playing for time, but now the tables have somewhat turned, he says. For 23 years, Supreme Leader Ayatollah Khamenei has sought to preserve the status quo by avoiding transformative decisions, Sadjadpour says. "Now, with these sanctions, Khamenei's back is increasingly up against the wall. And he has two ways of seeking relief: One is in the form of a nuclear compromise, and the other is in the form of a nuclear weapon." Meanwhile, Israel may be planning its own pre-emptive strike against Iran's nuclear facilities. "Israel has made it very, very clear," Rogers says. Israel has "red lines," he says, "meaning that if Iran gets so far in their nuclear weapons program that they can't stop it, then all bets are off." That line isn't far away, Rogers says. If it did decide to attack, Sadjadpour says, Israel is confident it could set back Iran's nuclear program one to three years, even without U.S. assistance. Yet, he warns, "if Israel starts it, they can't finish it — and it would require U.S. involvement." "A unilateral Israeli strike is probably not in the best interests of the U.S.," Rogers says. There's a defense pact the U.S. has made with Israel that says the U.S. will defend Israel if attacked under any circumstances. If Iran retaliates, he says, the U.S. would be drawn in involuntarily. Rogers believes Iran is close to getting the bomb. "That's why they are so eager to brag about their enrichment capability," he says. If Iran were simply successful in one of its bomb attacks that might be enough to trigger forceful reactions. "According to the law of averages, if Iran continues to aspire to commit these acts of terror, at some point they're going to be successful," Sadjadpour says. "They are going to hit their target, and if they hit either a major American target abroad or they strike on American soil, I think it's going to be difficult for President Obama, in an election year, not to respond." Rogers, who was in Congress during the lead-up to the Iraq War, says the rising rhetoric between the countries makes military conflict all the more possible. "If, God forbid, it gets to that point — and I hope it does not — you won't see big troops on the ground," he says. "It'll be a dismantling of their capability to continue down this dangerous path of a nuclear weapon." NPR's Tom Gjelten contributed to this report.